As part of the process of Bank’s closing its banking business in India, the Bank will be closing all zero balance accounts which the bank was notified as being attached by certain regulatory or government agencies. Such closure notice has been sent to the last intimated address of the relevant regulatory/ government agency as per bank’s records. As per Government of India notification dated June 1, 2017, the last date to link your Aadhaar number with your bank account is March 31, 2018. Please note that vide Supreme Court order dated 13.03.2018 in Writ Petition (Civil) No. 494/2012, deadline for Aadhaar and bank account linkage has been extended till such time final order is passed in the matter. You may submit a self-attested photocopy of your Aadhaar card by visiting our branch at Mumbai or writing into: The Royal Bank of Scotland plc, Corporatedge, Office Numbers 108-114, Level 1 Building No. 10, Tower A, DLF Cyber City, Gurugram 122002, Haryana, India. Government of India proposes to implement Goods & Services Tax (GST) from 1 July 2017. Consequently, the existing service tax rate of 15% shall be replaced by GST @18%.In case you have registered for GST, please provide details of your GST Identification Number (GSTIN) and registration details (along with self-certified copies) that should be linked to the account/s held with RBS. As part of its simplification strategy, effective 8th October 2017 the Bank will close all the accounts which have a zero balance or will become zero balance either on account of transfer of funds by customers to another account or on account of debit of applicable charges levied by the Bank from time to time. The Schedule of Benefits/ Charges applicable to your account will be revised with effect from 1 October 2017. The account service charges will be revised from Rs 100 per month to Rs 500 per month. 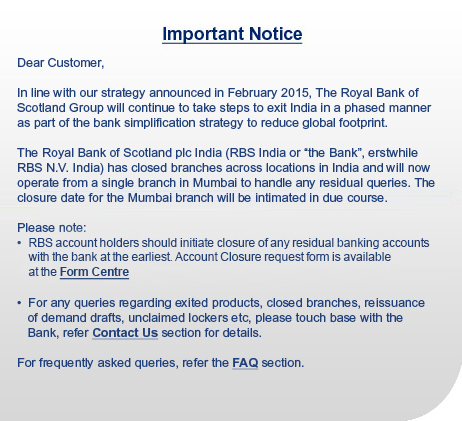 For further clarifications, please call our Bank by Phone or visit the RBS branch at Mumbai.